PT Ski were delighted to be a sponsor of the Amateur Interclub Championships (AICC) which were held in Alpbach last weekend. However I was there not only in my capacity as sponsor but also as part of the Marden's team, a club which has been operating in Klosters since 1929. Most of us arrived in Alpbach on the Wednesday evening in time to explore the resort ahead of hostilities commencing on the Friday. However much of Thursday was taken up by seeking refuge in a restaurant for a long lunch as the rain pelted down outside and we worried whether it was going to be possible to race the next day given the awful conditions and unhelpful weather forecast. Alpbach Visitors Ski Club (AVSC), our hosts, formally welcomed us to the event at a drinks reception that evening at the Hotel Boeglerhof and were cautiously optimistic that racing would be possible on both days. I am not sure how they did it but their team worked wonders on the race piste and they managed to produce a GS course that anyone would have been proud of even in cold wintery conditions. The racing was fiercely competitive and I was delighted at how the Marden's teams were performing. After this first event we were leading the Ladies and Young Ladies Categories and third in the 2 men's categories. There was everything to play for in the SuperG on Saturday. That evening the AVSC entertained us with a Tyrolean themed evening. Our young ladies team had managed to persuade their weak willed fathers (me included) to fork out on dirndls so that they looked the part, and I have to say they all looked fantastic. I managed to borrow some lederhosen off an Austrian friend so I could enter the spirit of it too. There was music, Austrian folk dancing, mugs of beer and dancing on tables. I have never been to Octoberfest in Munich but I am sure this was a mini version of it, only better. On Saturday the sun came out in all its glory and a beautiful SuperG course had been set down one of the main pistes. This was something quite special as the authorities don't normally allow racing on this slope. It was so exciting to ski, roaring down the slope at speed meandering through the gates, twisting and turning where necessary before arriving exhilarated at the finish. I could have quite happily gone up and down that course all day. As the racers hurtled down the tension began to build... were our times going to be quick enough to hold our medal winning positions! In short, no! The battle for the Young Ladies prize was the most competitively fought with only 0.25s separating Marden's from Kandahar on day 1, and in spite of the Kandahar men doing their best to sabotage our girls by plying them with drinks until the small hours of the morning, the girls again skied really well. However the run of the tournament was by one of the Kandahar girls who put the issue beyond doubt with a storming time and skied absolutely beautifully, recording the fourth fastest time of the day of everybody. A well deserved gold for the Kandahar girls, and my congratulations to Kandahar generally who won 4 out of the remaining 5 categories. Ski Club Arlberg were the other winner (in my category) and Marden's acquitted themselves well with 2 silvers and 2 bronzes. The event finished in relaxing fashion with a fun parallel slalom event in the sunshine on the ski slope in the village, where the pop up bar made itself very popular with those who had got knocked out. AVSC wound up proceedings with a lovely dinner at the Alpbach event hall where a live band meant that the more energetic could dance until the small hours. 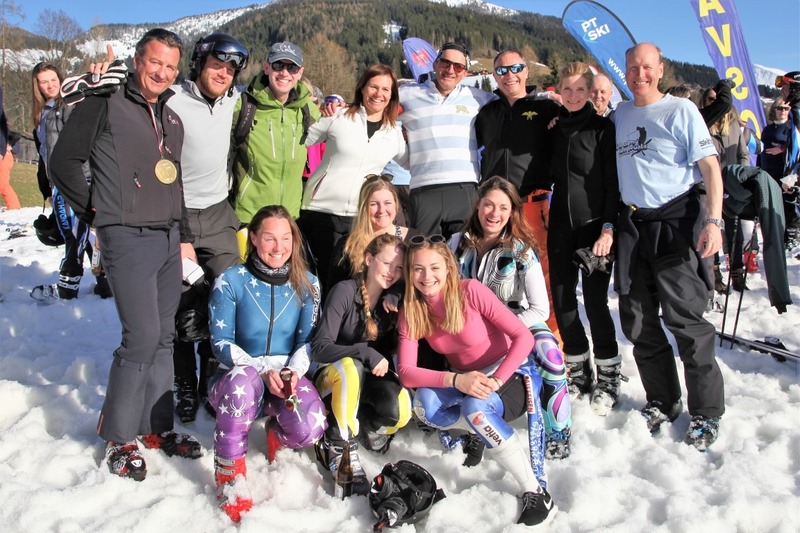 The AICC baton got handed over to Meribel Ski Club and the excitement is already building in anticipation of a successful foray to the Haute Savoie.